If you are looking for a beautiful relaxed place where you can spend time on your safari Uganda, then Lake Bunyonyi offers just that. Lake Bunyonyi Uganda; literally translated as “Place of many little birds” is a fresh water body located in South-western Uganda close to the Uganda Rwanda border. Lake Bunyonyi is the 2nd deepest lake in Africa after Tanganyika and one of the few lakes in the world said to be Bilharzia free. This magical lake is surrounded by beautiful terraced hills terraced by the local Bakiga tribe living in this area offering beautiful scenery. The lake hosts 29 Islands some of which are uninhabited and others are inhabited by locals and tourist facilities. Its Islands have a rich history including Akampene (Punishment Island), Sharps Island and Bucuranuka (Upside down) among the many. Gifted with cool weather and tasty culinary delights like crayfish, take a Uganda safari to this perfect place for relaxing especially after your Uganda gorilla trekking safari or Uganda wildlife safari so you end your Uganda safari tour in style. Lake Bunyonyi boasts over 29 islands, but of these ‘Punishment Island’ stands out the most because of its history. Before the 1940s, getting pregnant before marriage was a taboo thing in the Bakiga local culture. Unfortunately, girls who did fall pregnant before marriage would be canoed to this very small island where they would either starve to death or die while trying to swim back to the shore. But did they really die there? Or were they rescued? Find out more about this as you canoe to see this notorious island with your guide. You may also opt to go for a motorized cruise around the lake. Visit Bwama Island and learn how a British missionary founded a leper hospital in 1921 – now converted into a school. Looking for a jaw dropping, heart racing experience? Try zip line that affords those brave enough! A stunning lake view which will create memories that last a life time. 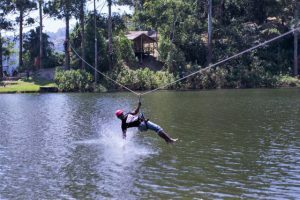 Zip line tours have exploded in popularity in recent years and it’s among the top safari activities to be enjoyed on a great Lake Bunyonyi safari as you will zip line across the lake passing over the space close to the waters of the second deepest lake in Africa. 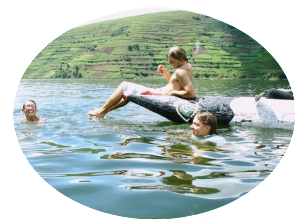 It has always been a fun game that was introduced on Lake Bunyonyi Uganda where by it was first done in mabira forest. While at the Lake, take a hike on one of the surrounding hills, and you will be rewarded by spectacular views of landscapes. You can also visit a local school and interact with school children this is a perfect opportunity to learn more about the people. A 20-minute boat trip will land you at Sam Mulisa’s hut, a traditional healer. Spend some two hours with him and learn about traditional medicine practices and more about how he has turned his home into a traditional clinic. Bunyonyi means ‘a place of little birds’. Just like its name suggests, the lake is home to over 200 bird species. For the bird lovers, this is a great place for a Uganda birding safari. You’ll have some great sightings of birds such as grey-crowned cranes, red-chested sunbirds and many flycatchers. Despite its depth, good swimmers have a chance to take swim in this beautiful lake. There are no crocodiles or hippos lurking in the shore waters and it is bilharzia-free. This is an incredible way to learn more about the lake, its people and traditions. You can go on guided tour, or simply rent your own and ride around the Islands. There are some great photographic opportunities at sunset when the rays reflect in the calm evening waters of the lake. 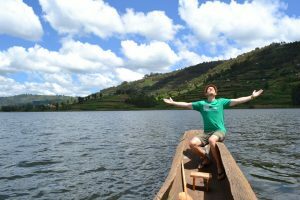 A great way to end yet another amazing activity-filled day on Lake Bunyonyi!